A family tradition of caring. The late Pennsylvania Gov. George M. Leader with his children (left to right) Michael Leader, President & CEO; Jane (Leader) Janeczek, Special Projects Coordinator; and David Leader, Chairman of the George M. Leader Family Corp. Board of Directors. 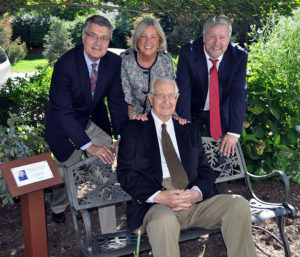 Country Meadows Retirement Communities continues a more than 50-year tradition of caring provided by the family of late Pennsylvania Governor George M. and Mary Jane Leader. “I, too, have a dream … for the elderly that they will be revered and appreciated for what they have given us as individuals and a nation. That their love and loyalty to friends and family and country will not be ignored but returned a thousand fold. That they will be given the freedom to work and participate in our economy and society as long as they wish. That the researchers and health workers wage war against diseases such as Alzheimer’s with the same energy they would give disease ravaging the young. Gov. Leader served as Governor of Pennsylvania from 1955 to 1959. His administration is noted for its accomplishments in promoting human welfare including that of seniors when he established the commonwealth’s first Office of Aging. This department laid the groundwork to make positive changes to better serve the state’s seniors. Gov. Leader also is well-remembered for his programs to bring new jobs to Pennsylvania; expand educational opportunities for residents with physical and/or mental disabilities; and improve highway safety. Another program of which Gov. Leader was especially proud is the state’s first licensure program for practical nurses. A strong humanitarian, Gov. Leader’s concerns for the state’s aging led him into a new venture and three years after leaving public office, Gov. Leader and his wife, Mary Jane, founded Leader Nursing and Rehabilitation Centers. In addition to providing skilled nursing care, the Leaders also provided the Centers’ residents with opportunities for socialization, entertainment and activities. The couple believed in putting the person first, his/her needs second and then figure out how to fulfill those needs. After selling Leader Nursing and Rehabilitation Centers in 1981, Gov. and Mrs. Leader envisioned services for seniors who need some assistance with daily activities but do not require 24-hour skilled care. Their dream was realized in 1985 with the opening of one of the first, if not the first assisted living communities in the Commonwealth—Country Meadows of Hershey. With an emphasis on wellness and a holistic approach to health care, Country Meadows added ten locations over the years, hosting apartments and services in a homelike setting, and restorative care for those who need a little more support than traditionally found in a personal-care setting. Though Gov. and Mrs. Leader passed away in 2013 and 2011 respectively, today Country Meadows remains 100% family-owned and managed. The family’s main emphasis through the years has been to provide high-quality services at reasonable costs through a well-trained and highly motivated team of professionals. Beyond the family’s involvement in the profession, their commitment has never changed—a philosophy of friendly, person-to-person caring that has become a Leader tradition. Today, Michael Leader, Gov. and Mrs. Leader’s son, serves as President & CEO of Country Meadows. Michael has served in various capacities in healthcare management for over 35 years. A former President of Pennsylvania Health Care Association, currently he is a member of the Governor’s Advisory Board on Health and of the National Center for Assisted Living (NCAL) Senior Executive Advisory Council, an organization that represents assisted living communities throughout the nation and Chairman of the George M. Leader Family Corporation (which oversees operations for Country Meadows Retirement Communities, Ecumenical Retirement Community and sister company Providence Place Retirement Communities). Michael is a graduate of Haverford College, has a Master’s degree from the Wharton School and Juris Doctor degree from Penn State Dickinson School of Law. Michael and his wife, Karen, live near Hershey and are proud parents of four children, one of whom, Kristin, works at Country Meadows. Ted Janeczek is married to Gov. and Mrs. Leader’s daughter, Jane. He serves as the Executive Vice President and Chief Financial Officer for George M. Leader Family Corp. and has been part of this family business since 1987. He serves on their Board of Directors and as Secretary of the corporation. Ted is a 1974 graduate of Lafayette College with a B.A. degree in Economics, a 1975 graduate of the Stern Graduate School of Business, New York University with an M.S. in Accounting. He is a Certified Public Accountant licensed in Pennsylvania and a member of the Pennsylvania Institute of Certified Public Accountants. He has held the position of Vice President-Trader for both First Boston Corp (1987), and Citicorp Investment Bank (1981-1987). Prior to that, he was both a Senior Accountant and Senior Consultant with Peat, Marwick, Mitchell (now KPMG) in Manhattan, New York. His Board experience includes twenty-two years with the Alzheimer’s Association of Greater Pennsylvania, where he also served as Treasurer. Ted currently serves on the Board of the Pennsylvania Assisted Living Association and is a former Treasurer. Previous Board experience includes time spent as President of the Board of Governor’s of the Hershey Country Club as well as Board service to the Tri-County Association for the Blind. Jane Leader Janeczek, daughter of Gov. George and Mary Jane Leader, serves as director of special projects for Country Meadows Retirement Communities. In this role, she receives, develops and implements projects and programs of value to the company. She also serves on the board of directors as Assistant Treasurer for the George M. Leader Family Corporation and chairs the Corporate Contributions committee. She also is a member of the board of directors of the George M. Leader Corporation which oversees partner company, Providence Place Retirement Communities. Jane is actively involved in community affairs in central Pennsylvania. She is the board chair of the Commonwealth Foundation—a free market public policy think tank in Harrisburg, Pa. Prior to joining George M. Leader Family Corp., Jane worked in marketing and management positions for the Xerox Corporation and Midlantic Bank (now PNC Bank) in northern New Jersey. Jane received a bachelor’s degree in Psychology from Lafayette College in Easton, Pa.
As Gov. and Mrs. Leader’s granddaughter, Meredith Mills has Country Meadows in her blood and is delighted to carry on her family’s mission to serve seniors. In her role, she oversees all personal care and assisted living operations and works closely with the Vice Presidents of Operations and the Resource Staff. Meredith joined our organization in 2011 and has held positions with increasing responsibility in marketing and operations including Director and Regional Director of Marketing, Executive Director and Vice President of Strategic Planning. Meredith also develops strategic partnerships with hospitals and healthcare organizations in the markets in which Country Meadows provides senior living services. She identifies opportunities for better communication between Country Meadows and hospitals and physicians to share internal data and clinical outcomes to coordinate the best care for residents. Meredith gained operational experience during her five years working with Urban Outfitters at the company’s Philadelphia headquarters. She has a master’s degree in Health Administration from Penn State University and an undergraduate degree from Franklin and Marshall College. Dan Mills is married to the Leaders’ granddaughter, Meredith Mills. He brings his years of business experience to Country Meadows. In his role, he evaluates and strategizes both current and new business prospects, assessing opportunities to potentially open new campuses, purchase land, make acquisitions and/or develop new lines of business. Additionally, he oversees the organization’s Capital Projects team to ensure current building infrastructures and interior design are up to date, fully functioning and providing the best amenities and environment for both residents and co-workers as well as supervises fleet management, internal purchasing and supply chain management. Since joining Country Meadows in 2011, he has served in roles that include Pathways Manager, Associate E.D., Executive Director at Hershey and West Shore and Vice President for Business Development. Prior to joining Country Meadows, he worked for Chubb & Son for six years as a specialist in risk management, supporting independent insurance agents in the Northeast Region. Dan has a master’s degree in Health Administration from Penn State University and his undergraduate degree from Franklin and Marshall College. Alex joined the family’s business in 2009 and leads as a project manager of Capital Projects. He overseas renovations, new development and maintenance projects, while partnering with the Safety and Fire department in training and emergency assistance. Alex serves in several community volunteer roles including with the Hershey Volunteer Fire Department and the Capital Therapeutic Riding Association. “I hope to keep the traditions set by my grandparents alive through the way our organizations provide customer service, innovative programming and quality of life for seniors,” says Alex. Kristin grew up aspiring to be a veterinarian, investing her high school and college years interning and working for various veterinary practices in the Hershey area. Before her senior year of college, she began leaning toward “human medicine” and took a summer job in direct care as a Personal Care Associate at Country Meadows of Hershey. Having grown up in the retirement living industry, interacting with seniors beyond just her own grandparents (founders of Country Meadows) had always come naturally to her, and with her medical interest, caregiving was an ideal match. That summer position enlightened her to what her family has accomplished is something special and she wanted to be a part of it. Kristin has a master’s degree in Aging Services Management from University of South California and a bachelor’s degree in Veterinary & Biomedical Science from Penn State University. When he isn’t conducting the orientation and guiding career growth for co-workers, you can find him spending quality time visiting with or helping our beloved residents. J.R. is currently pursuing a degree in Gerontology from Harrisburg Area Community College. *Members of the George M. Leader Family Corporation (GMLFC) board of directors, which oversees operations for Country Meadows Retirement Communities, Ecumenical Retirement Community and sister company Providence Place Retirement Communities.